Judging from the Walmart email I received shortly after placing my latest online order, the company has quietly begun testing their popular Savings Catcher program with online orders. I suspect they’re picking orders based on certain criteria, such as those that include some grocery type items, rather than selecting random purchases. 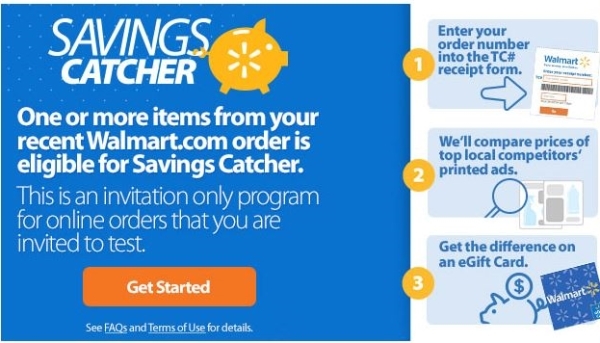 The missive I received said that online Savings Catcher is currently by invitation only, and the Walmart Savings Catcher FAQ still says that only in-store purchases are eligible for the program – not online orders. In case you’re not already familiar with Savings Catcher, it lets you get money back on your Walmart store purchases if items you purchased were on sale somewhere else locally. Walmart Savings Catcher rolled out nationwide last year in late August. To participate, you need to sign up for a Walmart online account if you don’t have one already. Then, every time you visit Walmart, scan the receipt using the Walmart app on your smartphone or enter a code and date from the receipt into the Savings Catcher area of Walmart’s website. Walmart Savings Catcher scans the ads of local competitors, including all grocery stores as well as drugs stores like CVS and Walgreens and dollar stores including Family Dollar and Dollar General. With Savings Catcher, Walmart makes it unnecessary to shop more than one store to find the brands you want at the cheapest prices. If I want to stock up on two-liter bottles of Diet Coke for my husband and it’s on sale at CVS for 99 cents, I can pick it up at Walmart and get the difference reimbursed through Savings Catcher. No special trip to CVS needed! Plus, CVS generally has a limit on two-liter soda bottle purchases when they’re on sale, usually four bottles. 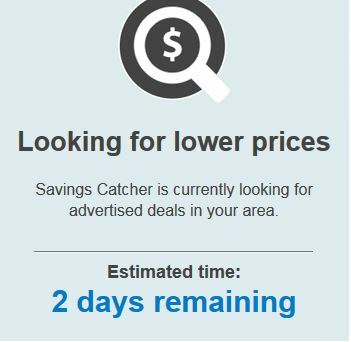 Walmart Savings Catcher does not recognize this limitation. If you purchase 10 bottles of soda that are on sale for $1.25 at Walgreens with a limit of 4 bottles, you’ll get the sale price on all 10 bottles through Walmart Savings Catcher.